Cette unité du 10ème étage, avec une vue imprenable, a été entièrement rénovée et décorée avec des tissus et des intérieurs personnalisés. Comptoirs en granit, appareils électroménagers de haute qualité en acier inoxydable, cuisinière à convection avec tiroir chauffant, four électrique au toucher de verre avec panneau de commande et table de cuisson personnalisés et bar humide éclairé avec refroidisseur de vin intégré de 18 bouteilles rester. Lits king-size dans les deux chambres avec grand canapé-lit dans le salon. La chambre d'invité a une porte de poche personnalisée, ce qui en fait une suite VIP avec salle de bain en suite. Télévision à écran plat dans le salon et principale, et télévision avec lecteur DVD pour les films uniquement dans la chambre d'amis. * Loué à des non-fumeurs ... seulement. * Location du samedi au samedi en saison. * Internet haute vitesse sans fil. * Parking pour 2 voitures. Lovely, well-appointed, well-equipped condo became the headquarters of our 50th Anniversary. Definitely not your typical beach rental. Hope to return. First off, if you found this unit through HomeAway and have not booked it, find another way to book it. HomeAway provides zero value and is just another useless middleman. This is a 30+ year old building and it shows. Dingy stairwells, exterior looks like it could use a good pressure-wash. Small and rather dirty pool, small parking lot. Construction next door was an ongoing annoyance. The onsite staff was friendly however. The unit was ok. Nice furnishings, comfortable beds, well-stocked and updated kitchen. The balcony is small and narrow, much smaller than we have seen at other locations. TV is bare-bones cable in living room and master bedroom. No cable at all in the 2nd bedroom, just a flat screen TV and DVD player. Bathrooms in need of upgrades. The entire area was extremely crowded the week we were there (May 6-11). Bumper to bumper traffic, waits at most restaurants, back row-only beach chairs if you didn't get down to the beach by 9:00AM. It felt like a fourth of July week and not the first week of May. Not sure when the off-season is on 30A but it definitely is not the first week of May. We are very sorry that your vacation experience didn't meet your expectations. The beautiful 30A area with its sugar white beaches and clear aqua blue waters has become a very popular area. While BeachCrest is an older building every effort is made to keep it updated and fresh. It is one of the most popular 2 bedroom - 2 bath beachfront vacation destinations in the area. With three(3) Full-Time Maintenance & Custodial staff the property & pool are being cleaned on a continual basis. If anything is ever brought to our attention every effort is made to correct it quickly. We were surprised at the less than stellar review of unit 1002, anyone can see from the pictures on our website that the unit has been totally updated & renovated, including both bathrooms. We were so impressed with this condo! The pool and beach were so convenient. Everything was as beautiful as the pictures. We can’t wait to come back again! We had a WONDERFUL time and the condo was absolutely darling and beautifully decorated and comfortable! But that VIEW! That is priceless!! Thank you for having it available for us to enjoy! My husband and I just stayed at Beachcrest #1002 for the first time. What a stunning condo! It has recently been totally remodeled and has the comfy, "beachy" feel that everyone wants when they vacation in Florida. The 10th floor balcony has an unobstructed panoramic view and was the perfect spot to sit and watch the calm ocean and the Manta Rays literally body-surfing in the waves. The updated kitchen has everything you might need to prepare meals or you can visit Seaside, Destin or Panama City Beach to eat out. All are located within a short drive. The kitchen even comes with a Keurig Coffee maker and blender...coffee for the mornings and margaritas for the rest of the day! This condo is the perfect fit for small families or couples. It has 2 bedrooms with king beds and a sofa bed in the living room. Combine that with 2 bathrooms and it's a luxury get-away! The swimming pool is located right off the ocean and is well maintained. It's even heated during the off-season. Even though we visited in December, the weather was pleasantly warm and we could have sat by the pool if we chose to. It has great Wi-Fi, 3 flat-screen TV's, cable, DVD players and a wet bar! It also has easy access from the parking lot with 2 elevators. Loading and unloading luggage is a breeze! The management company has representatives located onsite and they were very helpful during our stay! 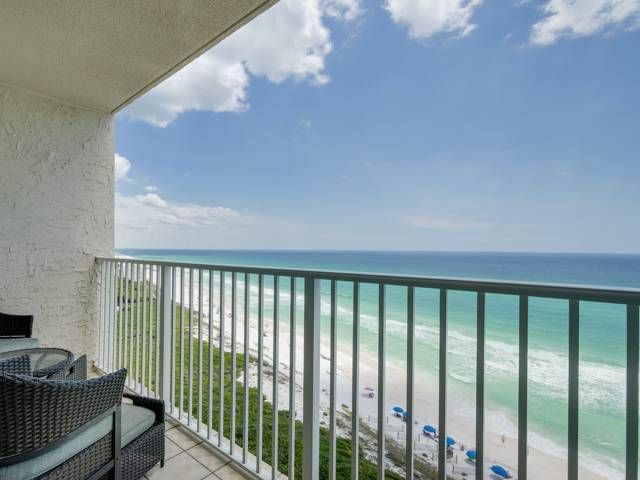 Beachcrest Condominiums is located on 30A and is about a mile from Seaside...close enough to ride bikes or walk to. There is a bike/paddle board/kayak rental company right across the street. No busy city life here...just waves and the sound of laughter on the beach! So peaceful! We highly recommend this condo! The white, sandy beach and calm, clear water is stunning! From the moment my husband and I arrived at this beautiful condo we were very pleased. It's beautifully decorated and the view is breathtaking. We are glad you had a wonderful vacation experience and look forward to seeing you back to BeachCrest in Beautiful Seagrove Beach soon! !